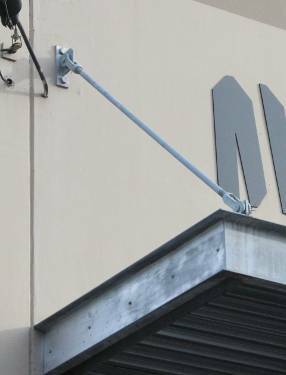 A tie rod assembly is used to brace steel columns or heavy timber beams or used to support canopies and awnings. 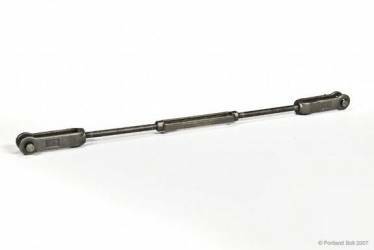 Tie rods are often used with clevises and/or turnbuckles. Our Tie Rod Calculator will quickly determine rod lengths when given overall pin-to-pin dimensions of a tie rod assembly. 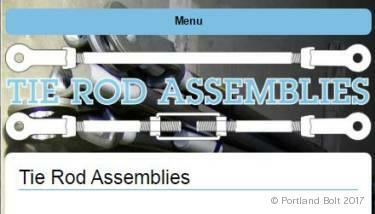 Portland Bolt manufactures tie rod or sag rod assemblies in many different ASTM specifications. Two common configurations of tie rod assemblies are used. One configuration consists of a single rod with left hand thread on one end and right hand thread on the other end. A clevis is threaded onto each end of the rod and the assembly is drawn tight by turning the rod. 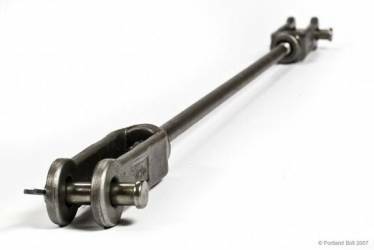 A second configuration of tie rod assembly consists of two rods with a turnbuckle in the middle and clevises on each end. For this assembly, one rod is threaded right hand/right hand while the other rod is threaded right hand/left hand. A turnbuckle is assembled between the two rods and the assembly is drawn tight by rotating the turnbuckle. Occasionally, tie rod assemblies are connected using sleeve nuts or coupling nuts. Tie rods are commonly manufactured using low carbon steel, but higher strength assemblies can be manufactured. Carbon or alloy steel tie rod assemblies can be supplied either plain finish or hot-dip galvanized, and stainless steel tie rod assemblies are common as well. Portland Bolt estimators can assist in determining the correct rod length. Complete tie rod packages are assembled in our facility to ensure accurate thread fit before shipping to your jobsite.